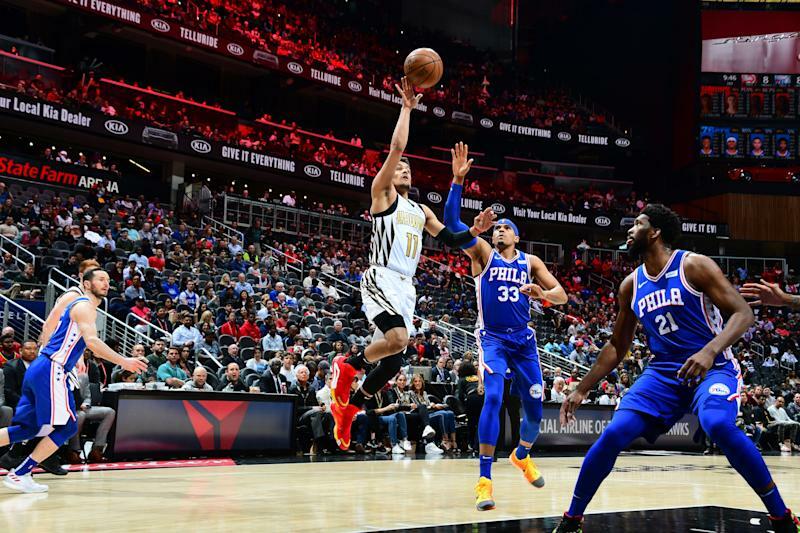 Once again, Atlanta Hawks guard Trae Young proved why he’s in the running for Rookie of the Year. The Hawks were tied with the Philadelphia 76ers with just 3.5 seconds left Saturday night at State Farm Arena, and had one last chance to knock off one of the best teams in the Eastern Conference. Naturally, they went to their star rookie. Young caught the inbounds pass at the top of the key, and instantly drove around Jimmy Butler to the hoop. He pulled up once he hit the free-throw line, expertly dropping the floater through the hoop to sink the game-winner, giving the Hawks the 129-127 win. The win for the Hawks snapped Philadelphia’s six-game winning streak, too. Young finished with 32 points and 11 assists in the win, shooting 11 of 20 from the field. Taurean Prince added 23 points for the Hawks, and Dewayne Dedmon finished with 17. Joel Embiid led the 76ers with 27 points and 12 rebounds, marking his 16th straight double-double. Butler added 25 points, and Ben Simmons put up 21 points. Young is in a tight battle with Dallas Mavericks guard Luka Doncic for the Rookie of the Year award, and has been all season. Young has averaged 18.5 points and 7.8 assists per game, compared to Doncic’s 21 points, 7.5 rebounds and 5.7 assists per game. While the Hawks are well out of playoff contention — they are currently 12th in the Eastern Conference standings with a 26-48 record — Young said they still have a lot to play for, especially when he can play in a moment like he did on Saturday night.